Once a dying breed but now a flourishing genre, the Nintendo Switch has become home to many scrolling arcade shooters since its launch last year. From the horizontal blaster that was Sine Mora EX, to the mind-bending, screen-hopping adventures of Dimension Drive, there’s plenty of variety to be found within this particular genre now on the Nintendo eShop – especially if you take the ACA NEOGEO ports into account. Of course, there’s always room for another one, but does RXN -Raijin- prove worthy against the competition already available? RXN -Raijin- is as anime as it gets. Transforming Mecha, large eyes, plenty of constipated screaming complete with an epic J-pop infused opening credit sequence that will make your brain melt. This little vertical shmup provides you with 50 bitesize levels to blast your way through. You choose between one of three interchangeable spacecraft/mech contraptions, all with their own set of unique weapons. Each consists of three gun types, as well as a screen-killing special move that sacrifices a portion of your health. Every gun that each pilot has is wonderfully over the top, filling the whole screen with your own army of bullets. As long as you seem to be shooting something, a gauge at the bottom of the screen builds up and increases your firepower even more when it hits 500 percent. The ship controls smoothly enough and your tiny hitbox makes navigating through the bullet hell manageable. It’s actually one if the easier top-down shooters that I’ve played, and would possibly be a low enough entry point for a newbie. However, nothing at all is explained to you – most notably, the gems that you acquire through the levels. They come flying at you in various colours as a reward for your effort and tally up at the end of the stage. From what I can gather, it contributes to the levelling up system in some unnecessarily complicated way. In regards to the plot, I had absolutely no idea what was going on. Everything is voiced in Japanese with a tiny window in the corner of the screen for subtitles during gameplay. While this isn’t usually an issue for me (after all, I do possess the ability to read), it just becomes hard to follow when trying to avoid bullets that are flying at you like a murmuration of giddy starlings. As far as I’m aware, the baddies are called Ulka, and you are one of the good guys who’s out to destroy them all. Your teammates bob in and out of the conversation from time to time, along with a fella with a villainous laugh – who I assume is probably the main bad guy. Regardless, it’s an arcade shooter so who really cares about the story anyway? Well, I didn’t in any case. It’s actually quite impressive in how much dialogue does fit into the levels because most stages only take about 30 seconds to complete. In fact, I’m sure I’ve played WarioWare mini-games that have lasted longer. Just as you are getting into it, a cloud of mist fills the screen notifying you that the level is over, only for you to press through a few option screens to venture onto the next short-lived stage. On the other hand, while decent enough in a generic arcade kind of way, the game’s bosses can take a very long time to kill. Especially so if you are not at the required level to deal out the damage. This can also be said about the standard enemy types. Eventually, you will find that enemies become virtually impossible to destroy. Not because it is difficult, far from it. The reason for this is because you are meant to grind stages that you have previously beaten multiple times to level up your pilot. What makes this all hard work, is that the stages, bosses and enemies themselves don’t particularly offer a lot of variety. To add to the pain, you can only level up one pilot at a time. This makes the whole ordeal feel like a free-to-play mobile game that you refuse to actually pay into, except for, in this case, it has cost you nearly £30 for your effort. Even so, shooting crowds of enemies while dodging a ton of bullets is always fun to some extent, and the same can be said here. Blasting everything in sight did give me some satisfaction, especially with the powerful artillery that is available to you. I just never felt the payoff due to how brief the levels are. It also doesn’t really do anything new for the genre. There are no extra weapons to pick up and the enemy patterns are instantly predictable – it just doesn’t do anything original enough to keep me enticed. Visually, it’s technicality underwhelming. There are a few tricks in place to give it some flair, along with its over the top Japanese-style, but all in all, it looks like a hi-res Nintendo 3DS game. Not only that, as soon as the screen gets busy, there’s an unforgivable amount of slowdown infecting the experience. Now, this clearly isn’t a hardware limitation issue, it is a bullet hell shooter that’s supposed to congest the screen. There really isn’t a good excuse for it, especially considering how basic the graphics are. Take the player’s ships, for example. You can transform into a mech in between levels which is fun for about as long as it takes to beat a stage. While this is a cool feature and all, the ship itself looks like an unfinished model, lacking any textures whatsoever. At least the sound is decent enough for the most part with a bit of drum and bass booming in the background, but even the audio can sound broken at some points. For the price that RXN -Raijin- costs, you could easily buy a handful of much better arcade shooters instead. While its eastern flavour attracts to some degree, it doesn’t substitute the sluggish performance and cheap presentation that this game provides. 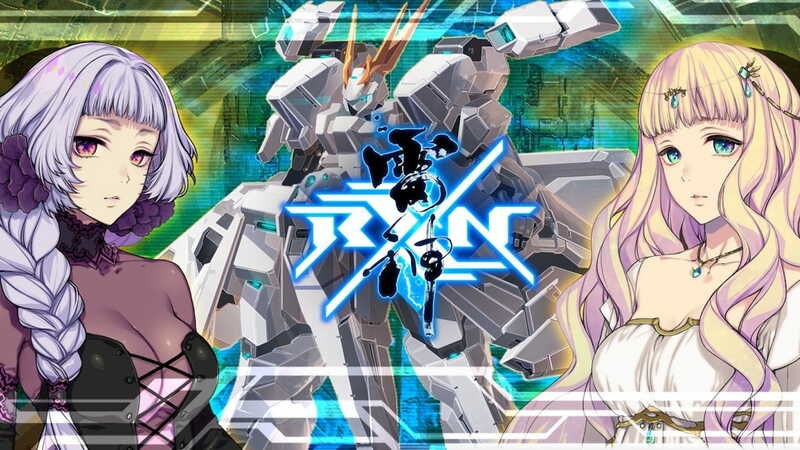 If you want a moderately easy arcade shooter with tiny levels that you can grind to death, then RXN -Raijin- may very well be something you’re looking for. Otherwise, you may be best saving your pennies.